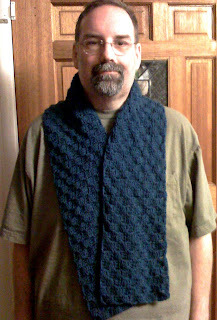 Well sis amazed me with the Diagonal box stitch scarf she was making so I thought I would make one for hubby. I want to also thank Sandie Petit at Crochet Cabana for her great tutorial. I had fun making the scarf. 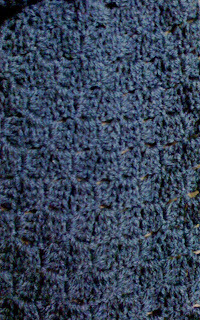 I used Red Heart Super Saver in Windsor blue. It is quite soft for Red Heart yarn. I was surprised. I used a "G" hook and just made it as long as he suggested and it is perfect. Below is a photo of a close up and one of him with it on. There you have it. Another scarf completed. Not sure what I will work on next but I am sure I will think of something. Sis it turned out great and he looks so good in it. I love the design of a basket weave almost. He looks proud to wear it. And he posed for a picture! How wonderful. I love it. What a nice manly color and he looks great in it.